Sunrise CSP's core technology is the Big Dish, a low-cost, high-performance solar energy concentrator. The Big Dish is a large paraboloidal dish solar concentrator, with ~500m2 reflective surface area, that delivers highly concentrated solar energy, >2000 suns, to a receiver. The technical performance, manufacturing, operation and maintenance advantages of the dish ensure its superior commercial performance in today's and future CSP markets. 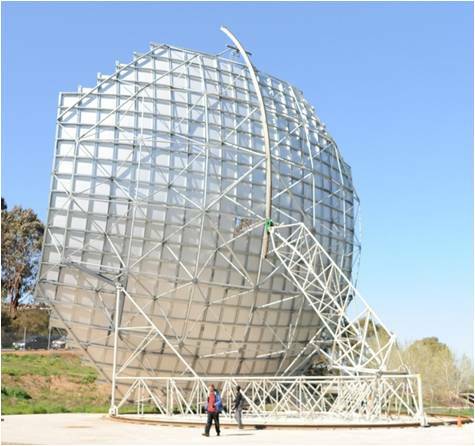 The photos below show the Big Dish Gen-II pilot built at the Australian National University (ANU) in 2009. 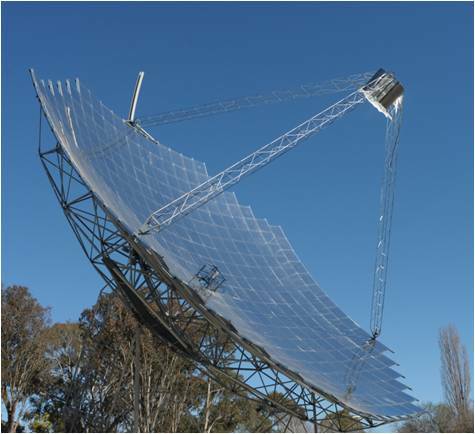 Superior thermal efficiency: The high average concentration ratio of the Big Dish (>2000 suns) means a much lower receiver area subject to thermal losses by radiation and convection. Sub-critical steam boilers achieve measured thermal efficiencies close to 90%. The technical efficiency advantages of Big Dish plants are illustrated in the graph below which shows the typical solar to electricity conversion efficiencies of each CSP technology type, as published by the International Energy Agency, compared to Big Dish modelling estimates and ANU pilot plant testing. Increases of Big Dish efficiencies above 26% can be achieved using alternative receiver types such as super-critical steam power generation, Brayton cycle turbines with combined cycle configurations or direct molten salt receiver / piping systems. The dish size (~500 m2 mirrored surface area), dramatically reduces solar field fixed costs (motors, control systems, receivers, etc) and optimises the dish's size dependent costs. Sunrise CSP holds patents or patent applications in target markets for the Big Dish structure. A typical super-heated Direct Steam Generation (DSG) Big Dish power plant consists of a large field of dishes connected to a central power block via an insulated piping network. Each dish tracks the sun and concentrates its energy to create super-heated steam at temperatures between 540oC to over 600oC and pressure of 150 bar to over 200 bar, depending on factors such as turbine selection. The operating temperature and pressure of the plant is the same as those found in a modern gas-fired or coal-fired boiler based power plant. To achieve power dispatchability, the power plant can be integrated with Sunrise CSP's SUMO energy storage system, or hybridised with gas or another fuel, to ensure guaranteed power generation in accordance with a dispatch schedule or a Power Purchase Agreement. The graphic below illustrates a power plant configuration with air-cooled condensors. 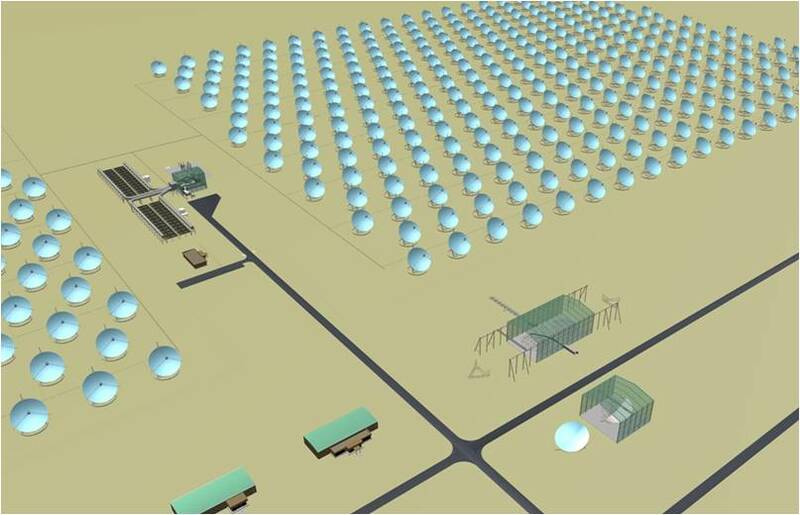 Energy loss in transmission of feed water and superheated steam in the piping network is minor due to low cost insulation, making very large solar fields of thousands of dishes feasible, enabling single plants of tens of megawatts to gigawatt capacity. Big Dish based systems are already competitive with other forms of CSP and are ready for commercial deployment. In addition, Sunrise CSP has a three-phase structured engineering plan to further reduce the LCOE of Big Dish plants to compete, without subsidy, with gas-fired generation by 2020 in markets paying world parity prices for gas. The engineering plan will deliver a decrease of LCOE of over 50% for Big Dish plants within six years of funding availability. This cost reduction plan requires no breakthrough technologies and is based on clearly identified design improvements, with a focus on manufacturing efficiency, standardisation of components, lean material use, further FiF automation, plant scale-up and high volume material and component sourcing. 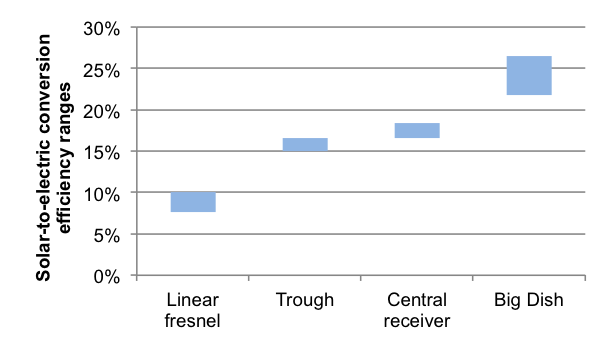 The graph below illustrates the cost reduction trajectory, by subsystem, for Big Dish based power plants over the three-phase program.